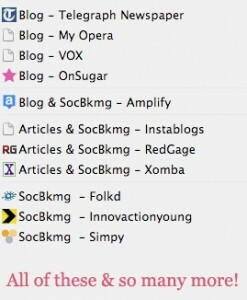 FREE download of my personal stash of bookmarks: loads of places for link building, neatly organised for you. Here for the FREE STUFF? If you’ve come here from Rhys’ fine blog for the free stuff, the wait is over! Once you’ve confirmed you’re a human (by confirming the link I’ll send you via email) you’ll be able to access the bookmarks download right away. So what are you waiting for!!!??? As well as the great freebie, you’re signing up for my email newsletter, which I’ll send out approximately once every three months. I’ll round up some of the most interesting social media developments AND inform you of any new posts on this blog.